Also known as the City of Dreams, Mumbai is the commercial capital of India and hence, it is home to hundreds of tourist destinations. People from all over the world frequent this beautiful city on account of its mesmerising spots which interest each and every type of traveller. From lakes to historical monuments and religious sites to beaches, there is everything which is capable of satisfying your wanderlust. So, this Shravan Maas, if you are looking for religious sites where you can provide Lord Shiva with offerings, then following is the list of Shiva temples in Mumbai which will certainly help you. Read on to know more about these temples, their location and historical significance. If there is any Shiva temple in Mumbai which needs no introduction and is popular all across the state, then certainly it is Babulnath Temple. The temple is not only known for its religious significance but also on account of its historical importance. Therefore, it is visited by history lovers as well as Hindu devotees. Did you know that Babulnath Temple is more than 800 years old? Yes, that's a long journey it has covered. The temple is located on a small hillock and is dedicated to Lord Shiva in the form of the Lord of babul tree. As per local legends, the temple was originally built in the 12th century. However, later on, due to some unknown reasons, it got buried and, therefore, lost in the pages of history. After a few decades, the idols of the temple were discovered by the locals and again, the temple was established. Today, the temple is one of the most popular temples in the state and is visited by millions of tourists and devotees every year. Located in the coastal region of Mumbai at a distance of about 1.5 km from Babulnath Temple, Walkeshwar Temple is also known as Baan Ganga Temple due to its close proximity to Baan Ganga Tank. The temple is dedicated to Lord Shiva and is one of the most visited temples in the region. As per Hindu mythology, Lord Rama stayed at the temple site for a while on his way to Sri Lanka. Therefore, the temple is considered as a holy site amongst Hindus. It was built in the early 12th century by a Brahmin during the rule of the Silhara dynasty. Even though the temple has been subjected to destruction and renovation several times, its overall beauty is still intact. Once you are within its boundaries, you can certainly feel the essence of divinity and calmness. Wouldn't you love to savour such an amazing beauty? 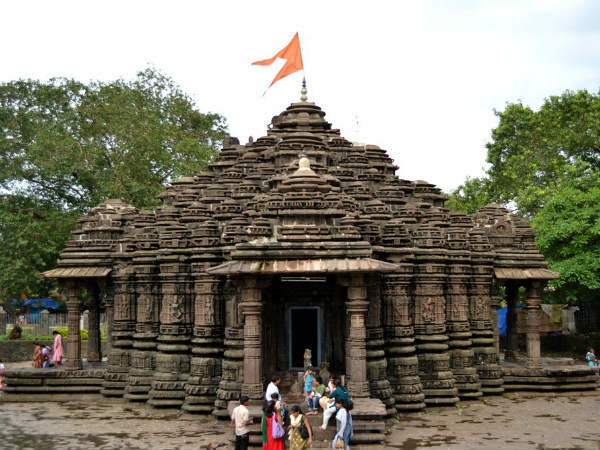 One of the few age-old temples in the region which have remained intact, Ambreshwar Shiva Temple was built in the 11th century and was built by Chhittaraja, a king of the Silhara dynasty. However, as per other local legends, the temple is said to have been established by the Pandavas overnight where they were seeking shelter during their exile. As they stayed here for only one night, they couldn't complete the temple and hence, you can still find the roof of the temple unbuilt. On account of its historical as well as religious significance, it is visited by Hindu devotees and history lovers both. The temple is also famous amongst architecture enthusiasts. If you are looking forward to witnessing the crowd of Lord Shiva's followers, then you must visit this centuries-old temple this Shravan Maas. Other festivals celebrated here include Mahashivratri. So, what do you think about a visit to this incredible beauty? Located on Elephanta Island, Elephanta Caves is a complex of cave temples dedicated to Lord Shiva. Therefore, it is considered as a holy site amongst Shaivites. As per historical records, these temples were made before the Common Era. Today, it is known for its historical, architectural and religious significance. Therefore, it has been inscribed to the list of UNESCO World Heritage Site. If you desire to travel back in time and find yourself in the midst of beautifully carved monuments and sculptures, then Elephanta Caves in Mumbai is a perfect place you should visit. After all, you cannot savour such monumental beauties everywhere in Mumbai. Here, you can find several beautiful sculptures related to Lord Shiva and Hindu mythology. Wouldn't you love to witness their grandeur and scrutinise their majesty? If yes, then Elephanta Caves is your destination this weekend.